Brazilian Portuguese Levels 1-2 (60, 30-min. daily lessons + Reading Lessons) Mobile app with interactive learning and review tools teaches speaking, understanding, and reading. Modified version available for desktop. 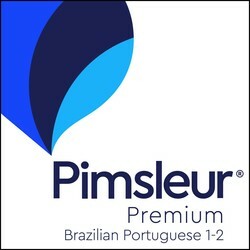 This Brazilian Portuguese program includes all of Pimsleur’s Portuguese (Brazilian) Levels 1 & 2. 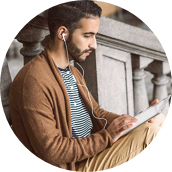 With this program you start from zero, first learning survival phrases and vocabulary, and eventually progressing to an intermediate level of speaking, understanding, and reading Portuguese. Every lesson contains an introductory conversation, and isolated vocabulary and structures, as well as full practice for all vocabulary introduced. Emphasis is on pronunciation and comprehension. At the completion of this course, you’ll be able to speak comfortably about things that happened in the past and make plans for the future; you’ll speak confidently using your wide-ranging vocabulary, and experience the Portuguese language and Brazilian culture with a deepening insight. Reading Lessons are included for each level. In Level 1, you'll learn to sound out words then phrases and sentences. In Level 2, you'll continue to practice reading, improve your pronunciation, and learn new vocabulary. Before you know it, you’ll be reading with the ease and flexibility of a native speaker.